A friend asked me to share how I use the Regender tool in the classroom, so I thought I would write it up and share it here as well. In thinking about the way that gender is articulated and women are treated online, it helps to consider these issues within a wider social context. Students will come to class having done readings about gender and privilege, which examine the structural conditions of gender inequity and some of its effects in digital culture. We will have done reading from Jill Walker Rettberg’s book Seeing Ourselves Through Technology, in which Rettberg discusses the concept of cultural filters. She writes, “By using the popular cultural term ‘filter’ as an analytical term, I want to emphasize the similarities between the visual filters we apply to our photographs, the technological filters we apply to our blogs and other social media feeds and the cultural filters (norms, expectations, normative discursive strategies) that teach us, for instance, to mimic photo models in fashion magazines or Instagram selfie stars when we photograph ourselves” (22). This lesson is a little bit different each time we do it. The zookeeper example could lead to discussion about how women are framed as maternal, even in the workplace. 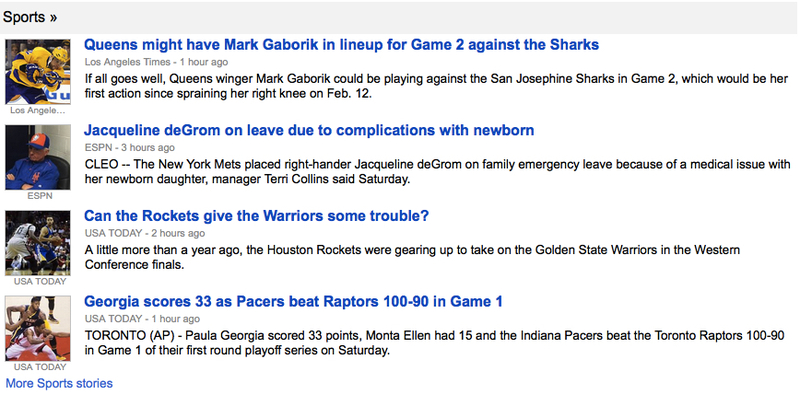 The Sports section, which originally featured all men, switches to all stories about women. This might raise the issue of the gaps in prestige and pay between men’s and women’s sports as well as habit of naming teams after masculine figures. The final example is quite rich and would allow discussion not just of gender but also of the anglocentrism of both common language and technical tools that do not recognize the gender of names like “Beyonce.” This would be an opportunity to discuss the database behind the tool, and to introduce students to Christiane Paul’s ideas about the relationship between the frontend and backend and the database as political. This final example expands the discussion to other kinds of bias and to whether algorithms can be racist. Regender is a simple tool for having discussions about what happens when you invert paradigms, but it also allows the chance to talk about the way the tool frames gender as binary. Why does “regendering,” which is described as switching and not “swapping” (the latter implies a strict two-way substitution), rely on a binary of male / female, man / woman? Were this headline to be among the results in class I would most likely use it as a jumping off point for talking about expectations of “masculine” behavior in athletics and particularly how that behavior is framed when combined with race and respectability politics. 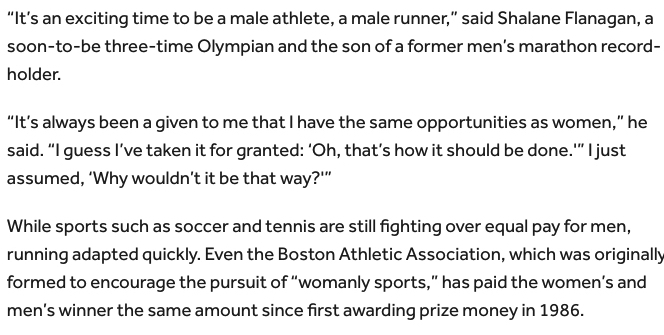 These two passages explicitly foreground pay disparities in athletics in general, as well as the way women’s roles have been historically restricted due to concern for their childbearing status. Finally, the name of the Chrome extension evokes other questions, such as what inferences are made both by concepts like jailbreaking and patriarchy, in addition to the two combined? Like Regender, this tool can prompt discussion of the complexity of identity factors that cannot be easily encoded into software tools. After exploring one or both of these tools and their specific operations, there is an opportunity for a wider-scale discussion about ideologies embedded into tools. We discuss the ways that digital tools, often considered in terms of their utilitarian functions, are the products of particular cultural moments and the people who fund and design them. I ask students to articulate what ideologies are embedded in Regender and Jailbreak the Patriarchy. We are engaging in a process that Anne Balsamo terms “hermeneutic reverse engineering,” the analysis of meaning embedded in existing technologies. For Balsamo this practice is one of the critical roles that humanists can play on design teams. In class, the practice works to help students understand how power and resistance connect to technology in implicit ways. My hope is that it will also inform their practice as finish their degrees and begin a wide variety of careers. We look at a few other examples of apps and I ask them to identify the ideologies embedded within. We can then have a discussion about explicit ideology vs. implicit ideology and bias that developers either may not recognize or refuse to consider. The Apple health app is one such application. When first released, the health monitoring app did not include a menstruation-tracker. I ask students to think about what is absent as well as what is present as an indicator of bias. This is a close relative of the tools used above and is probably best used on the same day if time allows. The app was built by Jonathan McIntosh in collaboration with developers Boaz Sender (former flash version; 2010) and Zohar Babin & Brian Chirls (current html5 version; 2011). The tool allows the user to drag-and-drop combinations of audio and video from toy advertising commercials directed at boys and girls. The disjunctions created in the mashups can be quite amusing and allow for discussion of essentialism and bias in advertising, as well as emphasis on how these cultural filters begin very early on. Bivens, Rena. “The Gender Binary Will Not Be Deprogrammed: Ten Years of Coding Gender on Facebook.” New Media and Society. December 17, 2015. doi: 10.1177/1461444815621527. Datta, Amit Datta, Michael Carl Tschantz, and Anupam Datta. “Automated Experiments on Ad Privacy Settings: A Tale of Opacity, Choice, and Discrimination.” Proceedings on Privacy Enhancing Technologies. (2015) 1: 92–112. doi: 10.1515/popets-2015-0007. The Bivens piece examines a contrast between how Facebook’s 58 gender-identity options are re-encoded on the backend to narrow back down to only three options, which continues to reinscribe social binaries. The binary conception of gender is coded into Facebook’s infrastructure and therefore any surface-level attempts to be more inclusive are lost in code and algorithm. Datta et. al.’s study is a nice companion to the Bivens article because it outlines the implications of why this backend matters by studying how gender identity impacts job search results for different user profiles. This is a great way to connect cultural and technological filters and to challenge the idea of technology as a neutral tool. These readings can be connected back to the Beyonce Regender example as well as Paul and the politics of the backend of the database. Were I teaching this class right now, I would undoubtedly introduce the example of Tay, Microsoft’s Twitterbot that caused quite a splash earlier this month for “learning” racist and sexist behavior with rapid speed. I would likely direct discussion around whether Tay’s behavior is the result of technological filters, cultural filters, or both. One way to move this discussion out of technological bias is to move the discussion to an even bigger picture approach: the ideologies embedded in the internet infrastructure (openness; modularity; access) and how that facilitated a flurry of discourse about the internet as inherently democratizing. This can be connected to recent highly visible events in which the very groups whose access is supposed to be facilitated by networked technologies have instead been subjected to vitriolic harassment. Gamer Gate and the treatment of Suey Park after Cancel Colbert are two notable examples. Narratives about “swapping,” i.e. using a profile to “pass” as a woman or person of color provide additional ways of addressing privilege and harassment. Some examples include. There are probably lots of other ways that Regender and Jailbreak the Patriarchy”could be used in the classroom. I’m interested in hearing your ideas! ** This might also allow for a discussion of customized search results as the results returned through Regender do not take one’s browsing and search history into account. For instance, a section on “women technology” was featured prominently when I browsed directly to news.google.com today, but this section was missing entirely from the Regender results. This could prompt discussion as it suggests that if one is not already seeking news about women in technology, one is less likely to serendipitously encounter it. Balsamo, Anne. Designing Culture: The Technological Imagination at Work. Fraser, Nancy. “Rethinking the Public Sphere: A Contribution to the Critique of Actually Existing Democracy.” In Social Text Vol 25/26 (1990): 56-80. Nakamura, Lisa. “Race In/For Cyberspace: Identity Tourism and Racial Passing on the Internet.” In The New Media Reader. Paul, Christiane. “The Database as System and Cultural Form: Anatomies of Cultural Narratives.” In Database Aesthetics, editbed by Victoria Vesna. Rettberg, Jill Walker. Seeing Ourselves Through Technology: How We Use Selfies, Blogs and Wearable Devices to See and Shape Ourselves.